The new order is more far-reaching than the president’s original travel ban, imposing permanent restrictions on travel, rather than the 90-day suspension that Mr. Trump authorized soon after taking office. But officials said his new action was the result of a deliberative, rigorous examination of security risks that was designed to avoid the chaotic rollout of his first ban. And the addition of non-Muslim countries could address the legal attacks on earlier travel restrictions as discrimination based on religion. Officials described the new order as a much more targeted effort than the president’s earlier one. Each of the countries will be under its own set of travel restrictions, though in most cases citizens of the countries will be unable to emigrate to the United States permanently and most will be barred from coming to work, study or vacation in America. Iran, for example, will still be able to send its citizens on student exchanges, though such visitors will be subject to enhanced screening. Certain government officials of Venezuela and their families will be barred from visiting the United States. Somalis will no longer be allowed to emigrate to the United States, but may visit with extra screening. Because it is likely that there will be court challenges to this new ban, the particulars of the policy may be changed before they are implemented. We will continue to provide updates as new information becomes available, but in the meantime, if you think you may be affected please contact the attorneys at Landau, Hess, Simon and Choi here, or by calling 215-925-0705. 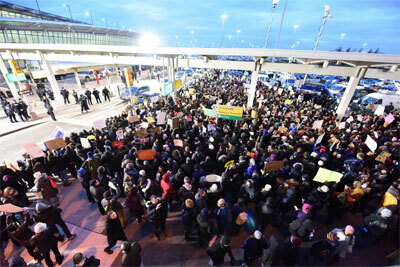 Above: spontaneous protests broke out at airports across the nation following the announcement of the original travel ban in March.